Clyde A. 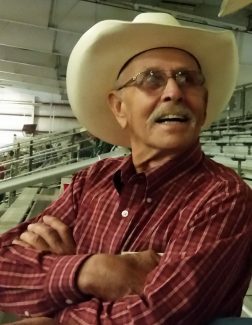 "Al" McKee, rancher and cowboy, passed away March 17, 2019, after a valorous battle with pancreatic cancer. Al was born in Grover, Colo., to Clyde A. McKee Sr. and Lottie Vanilla Miller McKee on Jan. 14, 1943, he was the youngest of nine children. In 1947, the family moved to Elk Mountain, Wyo., to continue ranching. In 1960, Al competed at the National High School Finals Rodeo in Hot Springs, S.D. Al later, in 1963, joined the Professional Rodeo Cowboys Association and was a PRCA Gold Card member. In 1961, Al married his wife of former years, Frankie Wells. Not long after, they moved to the Little Snake River to work with family on Al's father's ranch holdings. It was during this time that Al's two sons, Casey and Cody were born. In the early 1970s, Al ranched near Marlow, Okla., fueling his love for a good horse. Al continued ranching upon his return to Savery, Wyo. He enjoyed ranching in the big country, south of Rock Springs, Wyo. Al traded cattle from California to Texas, visited sale barns across the United States, Canada and Australia, meeting many great people and making lifelong friends along the way. A gathering of family and friends will be held June 22, 2019, in Torrington, Wyo. Memorial contributions may be made to the Casey McKee Scholarship Fund in care of LCCC Foundation at 1400 East College Drive, Cheyenne, WY 82007.